Gautam, Upendra and Shrish Rana, eds. 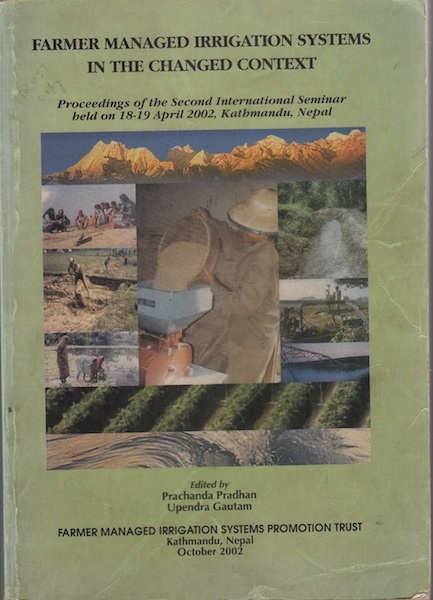 2001, Proceedings of the International Seminar on Challenges to FMIS, Farmer Managed Irrigation Systems Promotion Trust, Kathmandu, Nepal. Pradhan, Prachanda, and Upendra Gautam, eds, 2002, FMIS in the Changed Context, Farmer Managed Irrigation Systems Promotion Trust, Kathmandu, Nepal. Pradhan Prachanda and Upendra Gautam, eds, 2005, Farmer Managed Irrigation Systems and Governance Alternatives, Farmer Managed Irrigation Systems Promotion Trust, Kathmandu, Nepal. 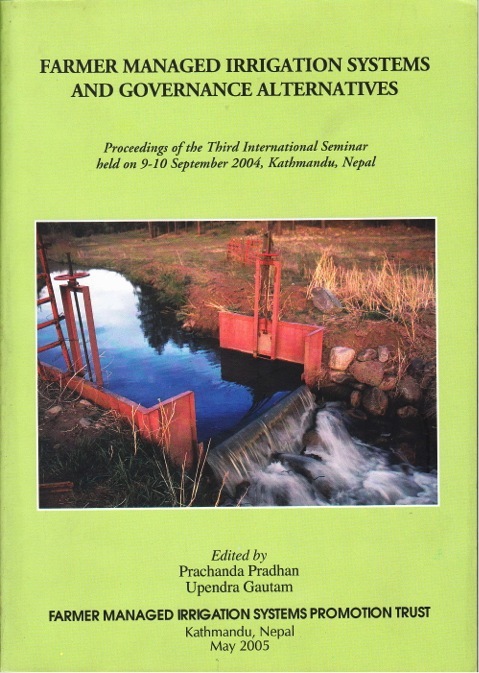 Pradhan Prachanda, Laya Prasad Uprety, Umesh Nath Parajuli and Upendra Gautam, eds, 2007, Irrigation in Transition : Interacting with Internal and External Factors and Setting the Strategic Action, Farmer Managed Irrigation Systems Promotion Trust, Kathmandu, Nepal. Pradhan Prachanda, Upendra Gautam and Naveen Mangal Joshi, eds, 2010, Dynamics of Farmer Managed Irrigation Systems: Socio-institutional, Economic and Technical Contexts, Farmer Managed Irrigation Systems Promotion Trust, Kathmandu, Nepal. Gautam Upendra, Rochak Ghimire and Vijaya Chalise, 2001, Introduction to FMIS Promotion Trust (in Nepali), Farmer Managed Irrigation Systems Promotion Trust, Kathmandu, Nepal. Pradhan Prachanda, 2010, Eroding Social Capital Through Incompatible Legal and Institutional Regime: Experiences from Irrigation Systems in Nepal, Farmer Managed Irrigation Systems, Kathmandu, Nepal. FMIS Promotion Trust, 1999, Report on FMIS Award and Training on the Theme of Conservation Measures in Irrigation Systems, Farmer Managed Irrigation Systems Promotion Trust, Kathmandu, Nepal. Gautam Upendra, Ajaya L. Shrestha and Ganesh Khaniya, 2001, Report on FMIS award and training on theme of resource mobilization for operation and maintenance of irrigation systems, Farmer Managed Irrigation Systems Promotion Trust, Kathmandu, Nepal. Gautam Upendra and Ganesh Khaniya eds, 2004, Proceedings of Third Award and Training Program (in Nepali), Farmer Managed Irrigation Systems Promotion Trust, Kathmandu, Nepal. Prachand Pradhan, Upendra Gautam and Naveen M Joshi, 2015, “Trajectory of FMIS” – compilation of key notes and summary of FMIST proceeding.